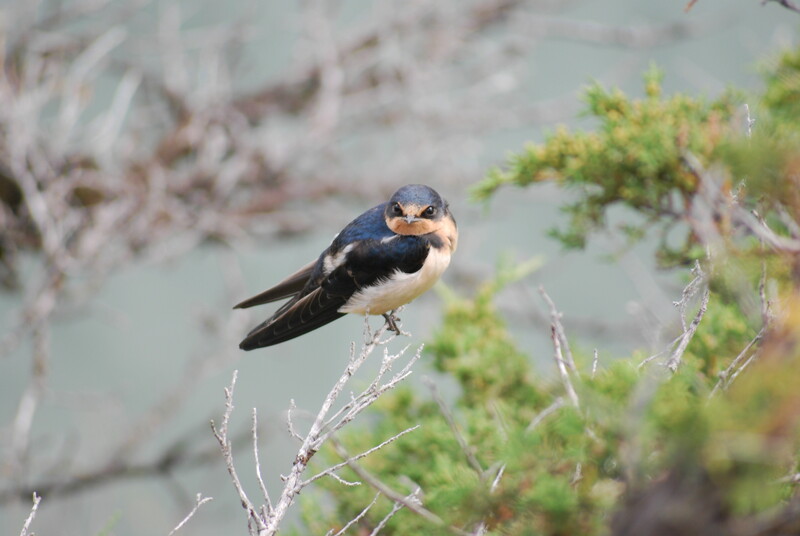 Historically, Barn Swallows nested on rocky surfaces protected from the rain, for example in caves or on cliff walls. Since Europeans arrived in North America, a great majority of Barn Swallows have switched to building their nests on man-made structures, like barns, garages, bridges, overpasses, culverts and houses. 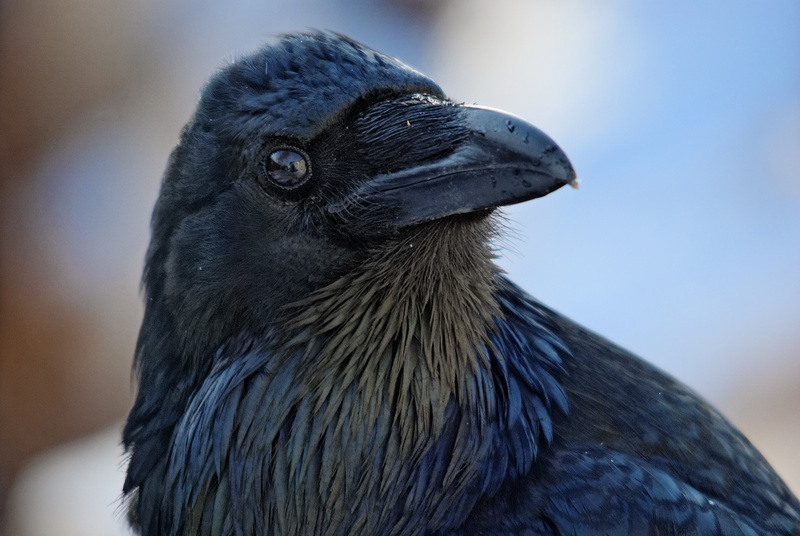 Any relatively undisturbed spot with a ledge to support the nest or a vertical wall to attach it and a roof to protect it may be used. In Europe, this association between humans and Barn Swallows started over 2,000 years ago. A single pair may nest at a given location, but several pairs can also nest together. Barn Swallows can live in small colonies of around 10 pairs nesting together, but up to 60 pairs have been known to form a single, loose colony. Barn Swallows defend territories of four to eight m2 around their nests against possible predators or other Barn Swallows. 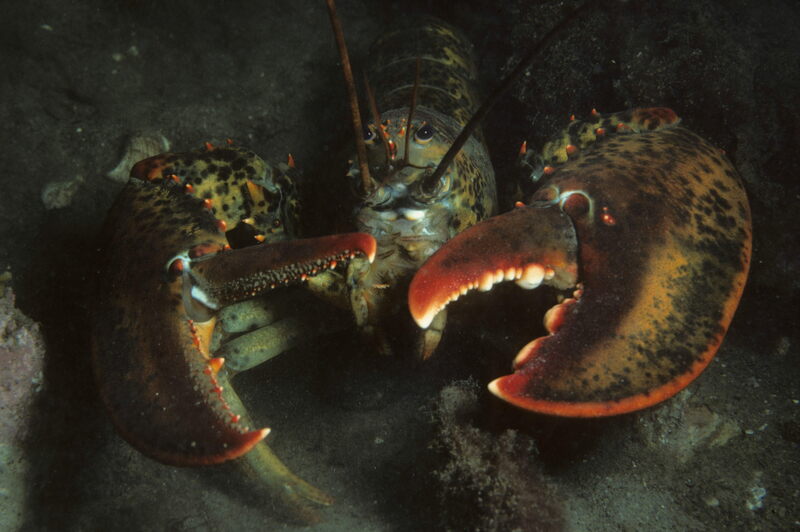 Often, the whole colony will act together in defending the area. Barn Swallows are dedicated builders. 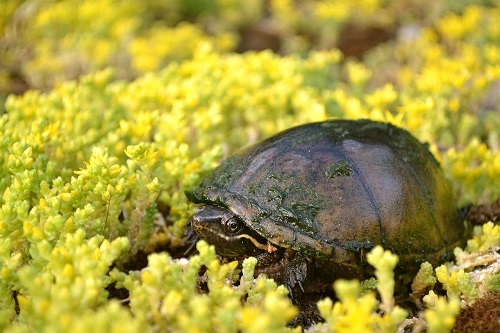 They pick up mud from places like river banks or puddles, and fibrous material, like grass, and arrange them into cup-shaped nests. The interior of their nests are lined with grass, hair, and feathers. A pair of swallows can make over 1,000 trips, bringing back a mouthful of mud on each trip, to build a new nest. Because this is hard work, Barn Swallows frequently reuse a nest built in a prior year. When reused, new mud can be added on the structure and the nests lining is often changed. 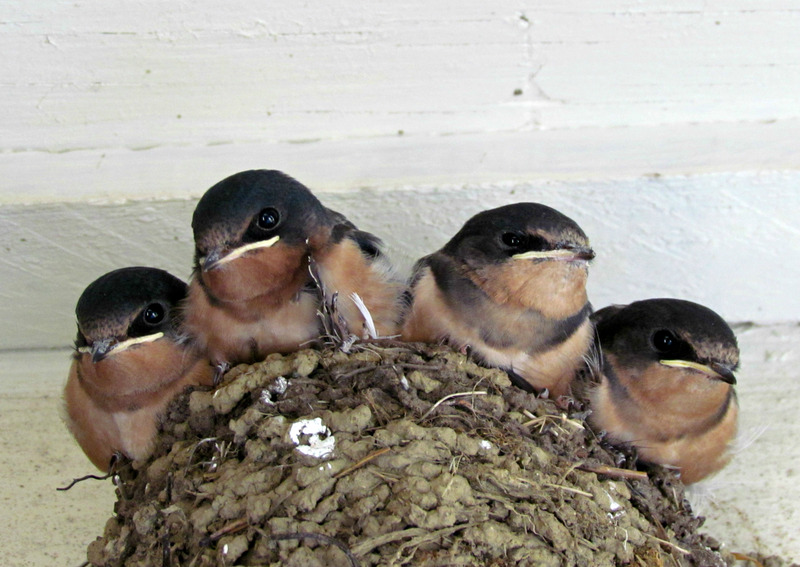 Barn Swallow nests can become infested by parasites over the years. In these cases, not only will the nests not be reused, but they can be abandoned prematurely during the summer, leaving the young to die. 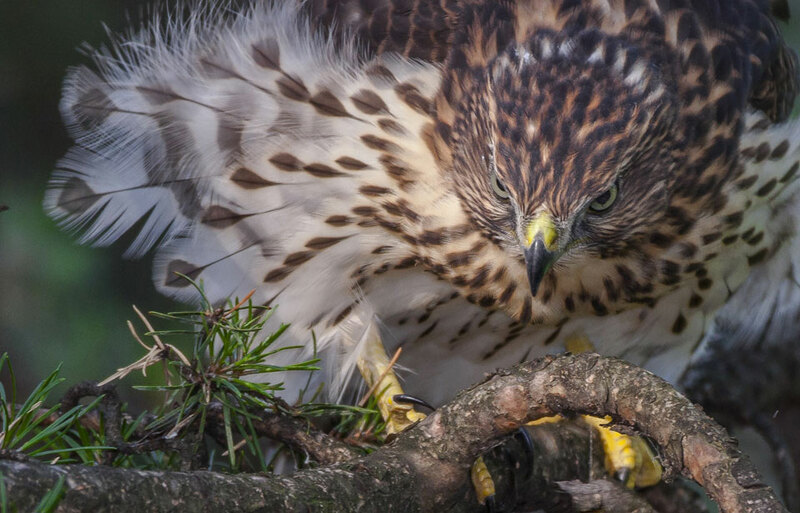 If a pair leaves their nest indefinitely, or if the nest is destroyed by wind or rain, a new nest can be found or built during the same nesting season. They often have 2 broods a year, sometimes in the same nest. Some Barn Swallows have an interesting relationship with Ospreys. They can share a nesting spot, with the swallows nesting just below the Ospreys’ nest or in an abandoned portion of it. 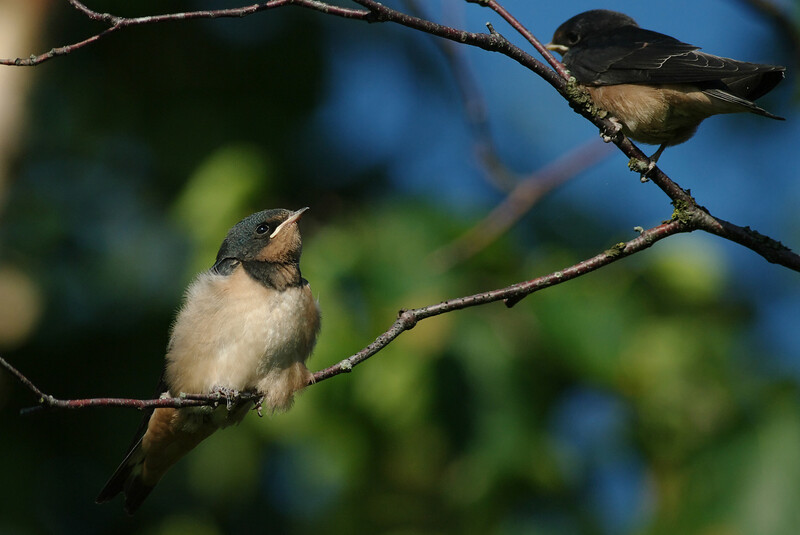 By cohabiting, the swallows benefit from the Ospreys’ protection, and the Ospreys can get an early warning sign of intruders by the swallows and their warning call. 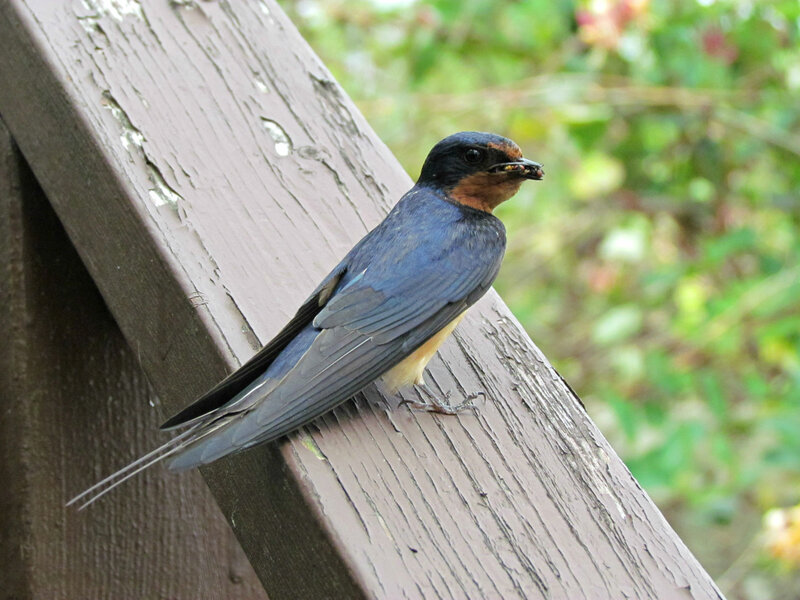 Although the Barn Swallow can travel more than one km away from its nest to forage, pairs often build their nests close to habitat where it may find food, and usually forage within 300m of the nest. 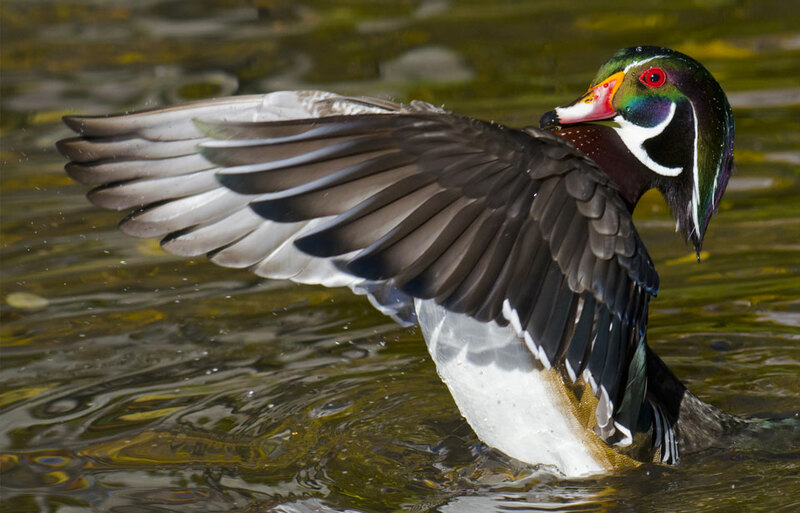 Many types of open areas create good foraging habitat, including suburban parks and ball fields, agricultural fields, grassy fields, tundra, shorelines, wetlands, and over open water in both freshwater and marine habitats. 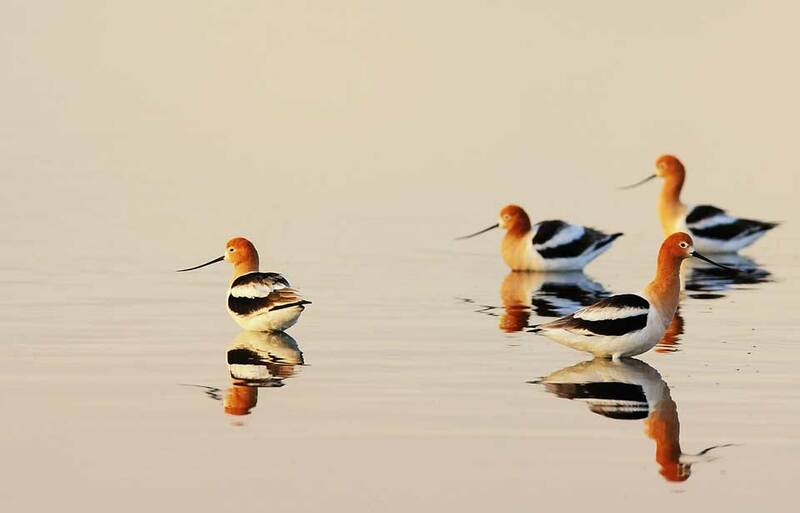 While they are migrating between their nesting and wintering areas, they fly in large flocks of sometimes thousands of individuals. Barn Swallows travel by day, foraging as they fly. 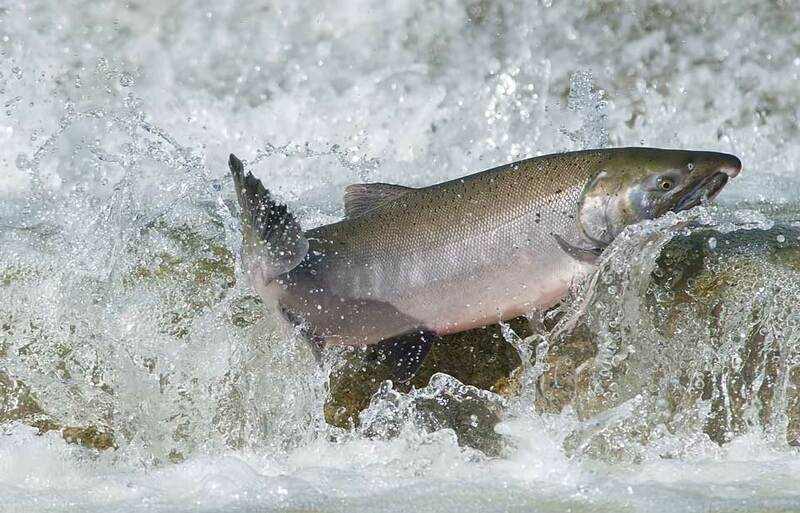 They migrate over open areas, along mountain ranges, often near water, such as along rivers. 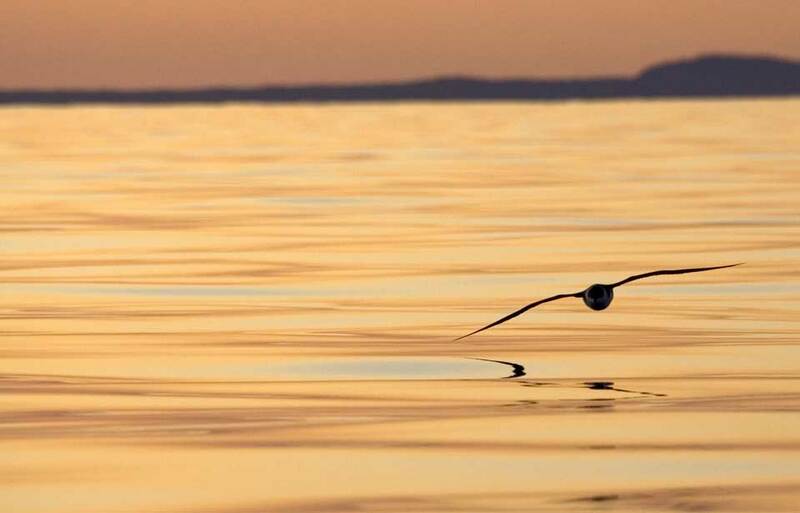 Some may fly over expanses of saltwater, for example the Gulf of Mexico. 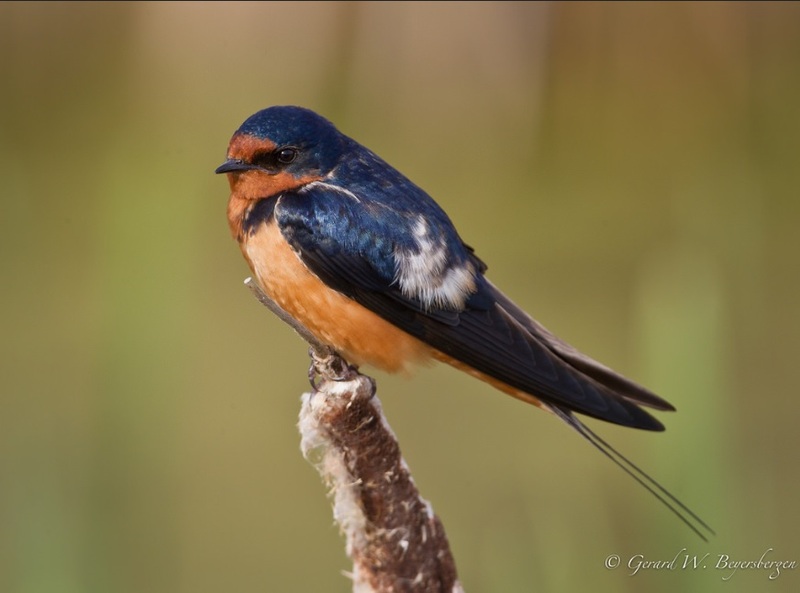 During the winter, Barn Swallows remain in large groups and can be found in the great variety of habitats from savannas to sugar cane fields. 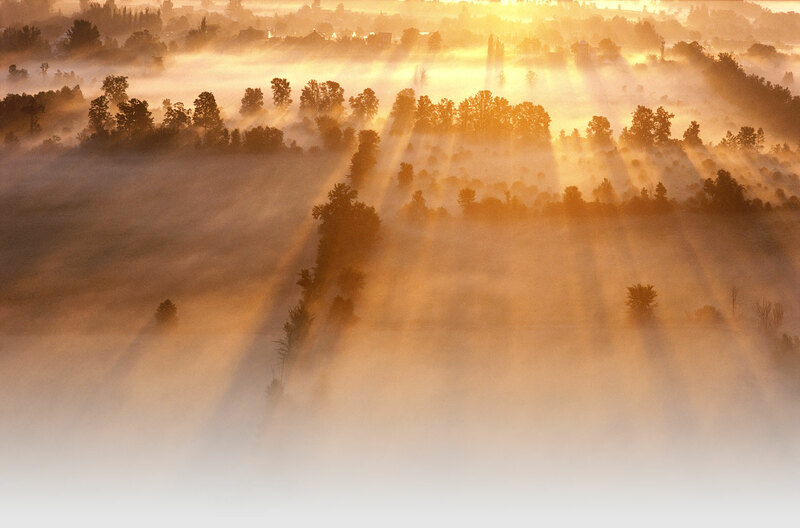 They tend to exclude areas with either very dense vegetation, like forests, or little to no vegetation, like deserts. The Barn Swallow is one of the world’s most common and widespread landbirds. It can be found on all continents except Antarctica. 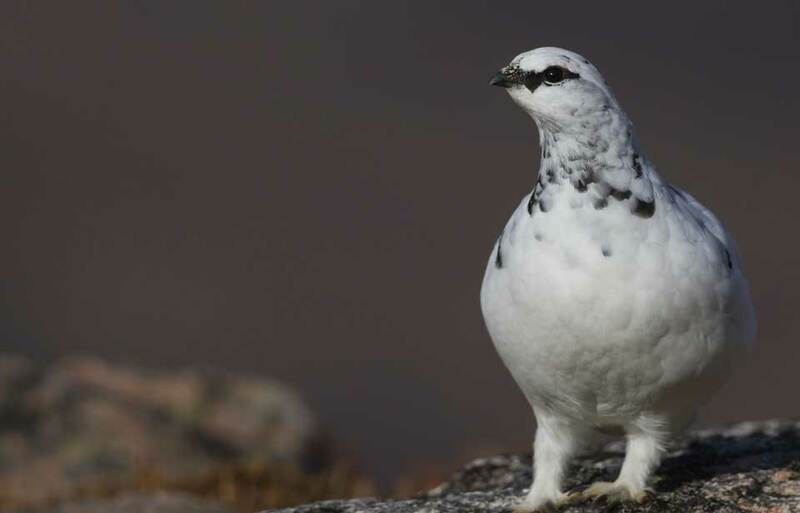 It nests throughout the Northern Hemisphere south of the tree line and up to elevations of 3000m. The entire Barn Swallow population is estimated as more than 190,000,000 individuals divided into six subspecies. Four of these subspecies migrate all the way to the Southern Hemisphere for the winter, making them long-distance migrants. 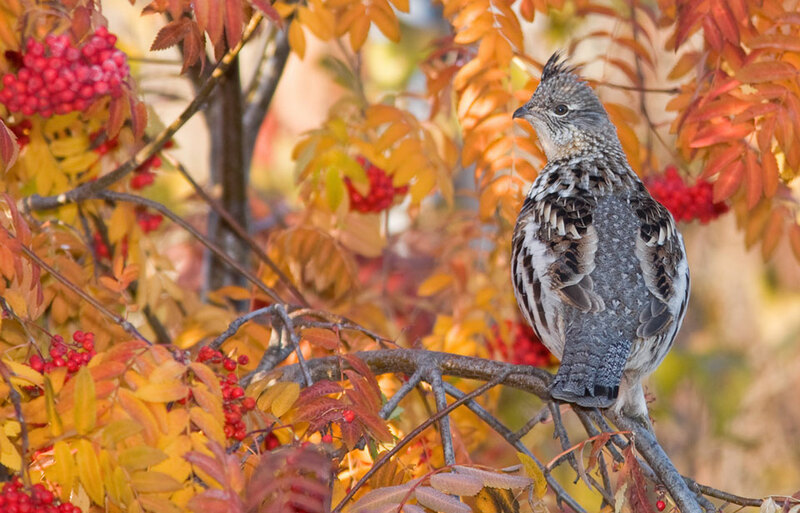 This includes the North American subspecies, which nests throughout Canada, the United States and northern Mexico, migrating all the way to Central and South America. While some individuals go all the way to the most southern tip of the continent, most stay in the eastern lowlands of South America. But due to the fact that these birds are very nomadic, and that they tend to change areas to roost with different groups at any given time, it is difficult to know where the swallows nesting in a specific area go for the winter. About 2,450,000 pairs of Barn Swallows spend their nesting season, from late April to Early November, in Canada, but most are away from Canada from September through April. 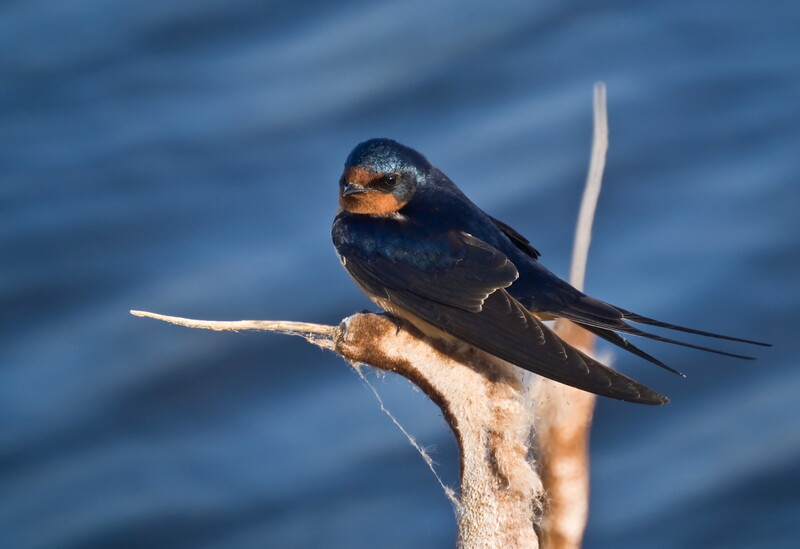 In some northern areas, swallows start migrating south as early as late July. 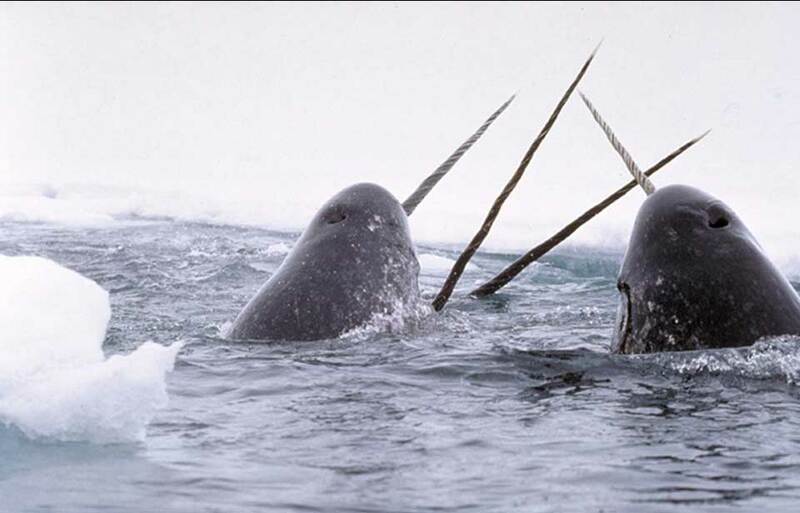 They are found in every province and territory except Nunavut, where they are rarely seen. 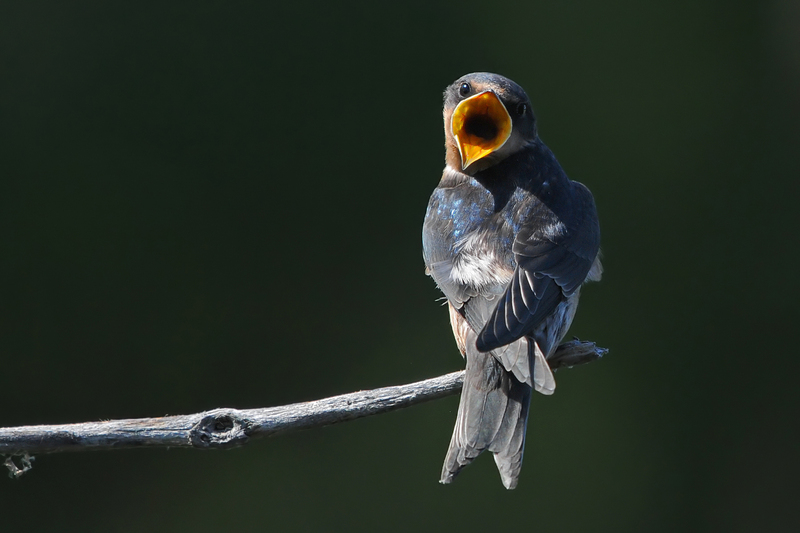 Barns Swallows, like other swallows, martins and swifts, are aerial insectivores. 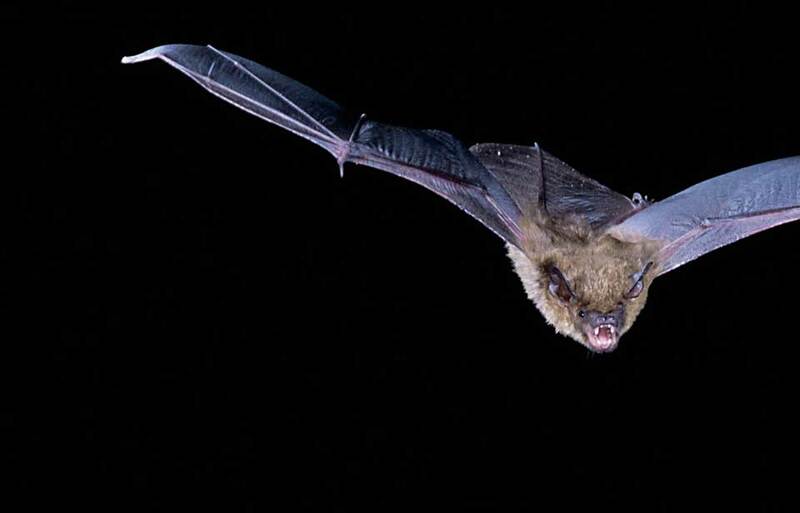 This means that their diet is composed of flying insects caught, most often, in flight. Flies, grasshoppers, dragonflies, beetles, bees, wasps, moths and other insects make up 99 per cent of their diet. Swallows often follow agricultural machinery so that they can catch the insects disturbed by the work, or forage around livestock, as flies tend to congregate around domestic animals. 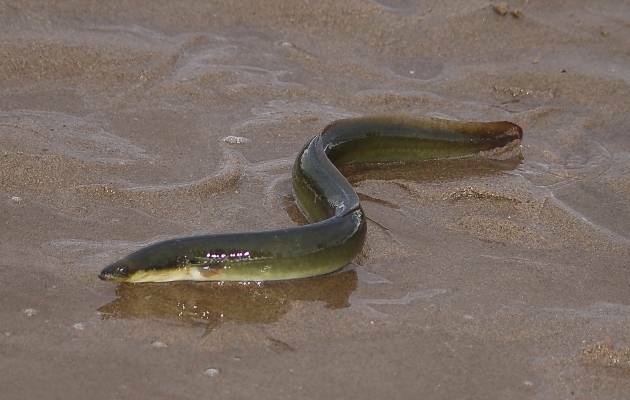 They tend to prefer catching one big prey at a time instead of several small ones, and they swallow it in flight. They can also feed their young and drink water, all while flying! During rainstorms or other bouts of bad weather, Barn Swallows may eat berries, seeds, insects on plants or other surfaces or dead insects. 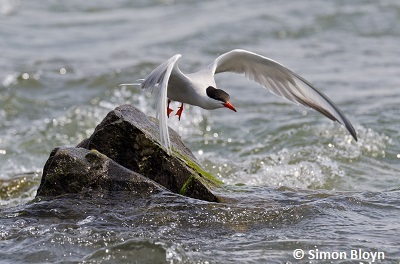 But long periods without being able to forage for flying insects can be traumatic for swallows and cause mortality in young birds and even adults. 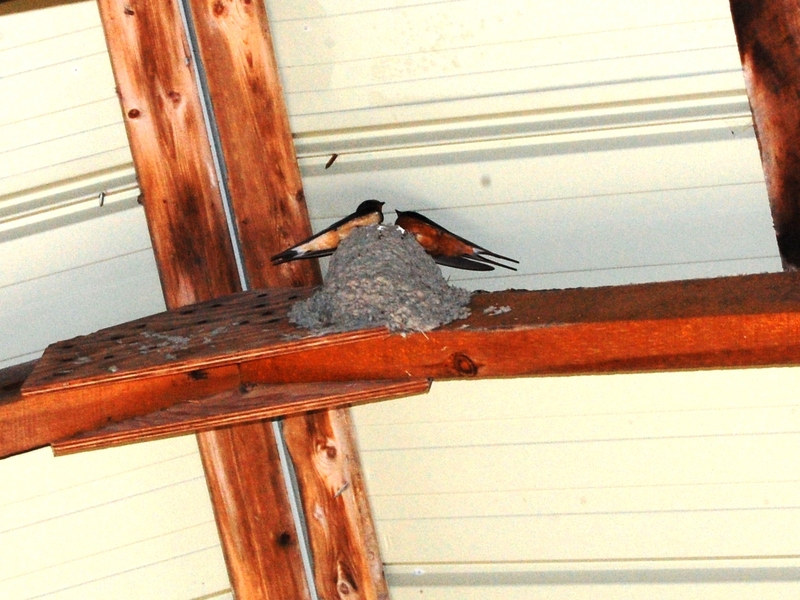 When Barn Swallows arrive in their nesting areas, pairs of breeding adults will form. Males will court females by singing and showing their tails. 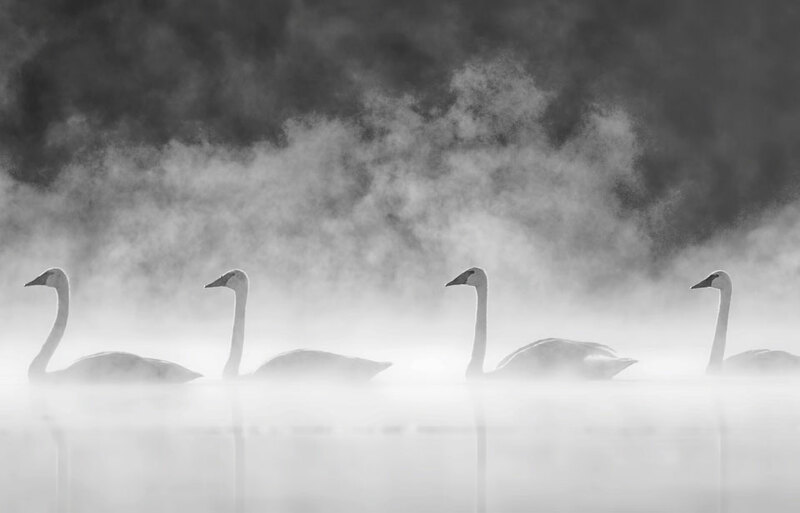 In Europe, females choose their mates by looking at the tail and wings’ symmetry and length, as these traits are more common in long-lived birds, but in North America, it’s the males’ colour that influences the females’ choice. After forming, a pair will remain together throughout the nesting season, making the Barn Swallow “socially” monogamous. 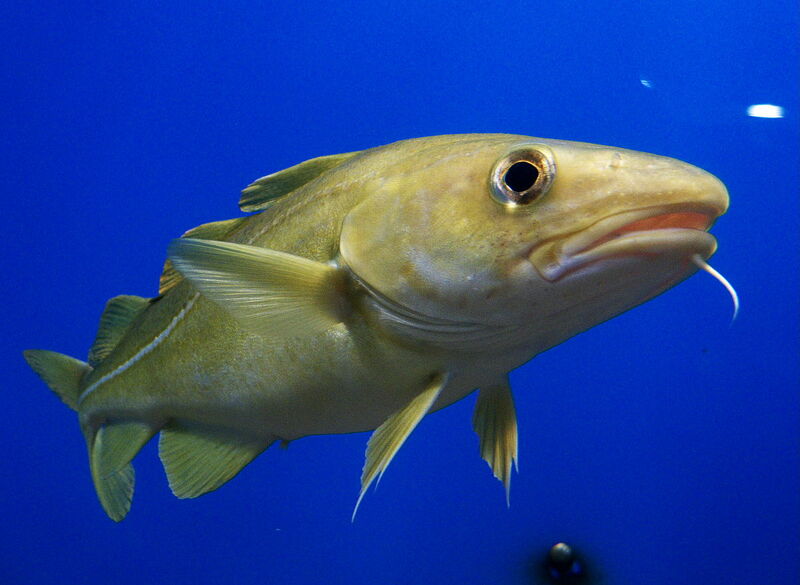 In truth, mating with other individuals is common for both sexes, and so the species is genetically polygamous. 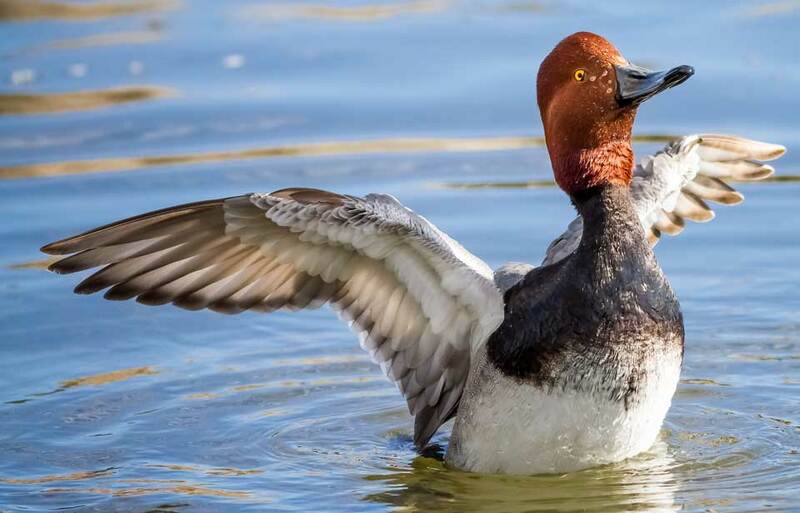 But pairs having successfully mated in the past may reform several nesting seasons in a row. 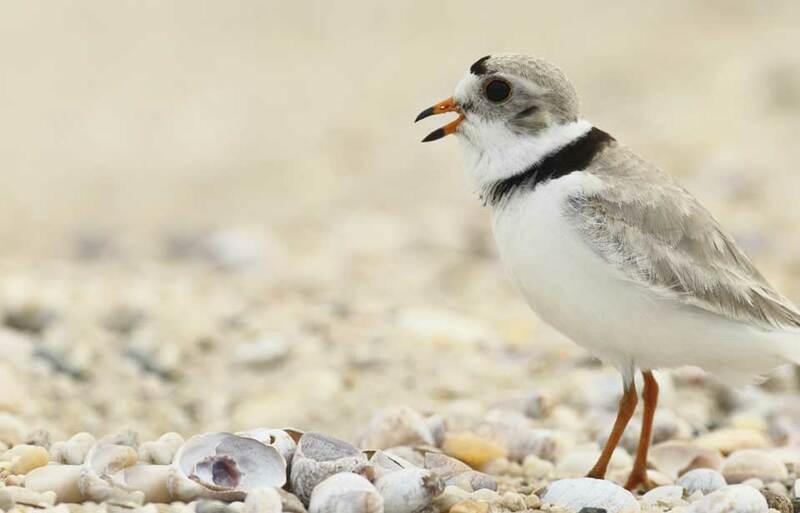 Unpaired adults may sometimes become “helpers” to a pair for the summer, helping in the nest’s defense and building, and in incubating the eggs. When a proper nest or nesting site is chosen, both male and female swallows participate in the building or the renovating or repair of the nest. When the nest is ready, normally in May, swallow pairs start mating and egg-laying. 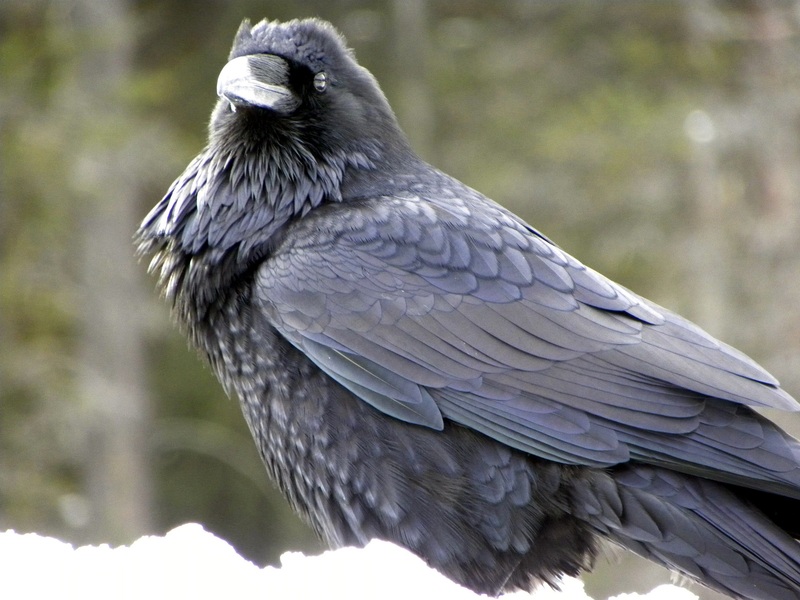 Laying two broods within the nesting season is common except in northern areas, especially if the first one has failed because of parasites, predators or bad weather. Three to seven small white eggs with reddish brown spots are laid. One egg is laid each day until the clutch is complete. Both parents and sometimes the helper participate in incubating these eggs for 12 to 17 days. After hatching, the helpless chicks remain in the nest for about 20 days, being fed compressed insect pellets by both their parents. Sometimes 400 trips per day are necessary to feed a single brood! Parents will continue to care for their young after they fledge (are able to fly), for about a week. Young Barn Swallows may remain in the area close to where they were born or travel to other colonies before migrating in the fall, which they do in the same flock as their parents. Although fewer eggs are laid during the first nesting season, young swallows are able to breed when they are about one year old. Since nesting and feeding habitat is more available since European colonization, researchers believe that it is very likely that the swallow’s population is larger than it was formerly. 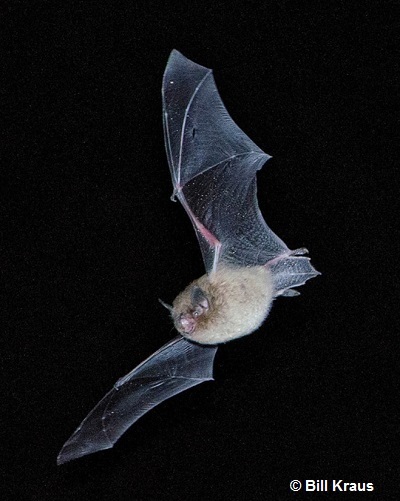 Even so, like many other species of aerial insectivores, their population is experiencing a large decline (of approximately 76 per cent overall) which started in the mid-1980s in Canada. Researchers do not fully understand the causes, but threats that Barn Swallows face in Canada likely include the loss of habitat brought on by the arrival of modern farming techniques and buildings (there are fewer open barns than there used to be), direct nest destruction by people, the loss of insect prey species because of the use of pesticides and the increase in the frequency of cold snaps during the spring, as swallows tend to return and nest earlier because of climate change. In addition to these threats, the swallow population may be affected by parasites, like mites, that infest nests and force swallow parents to abandon their eggs or nestlings, or by competition with other bird species, like the non-native House Sparrow, for nesting sites. Some of these threats are probably also having an impact on the species during their migration and in their wintering areas. 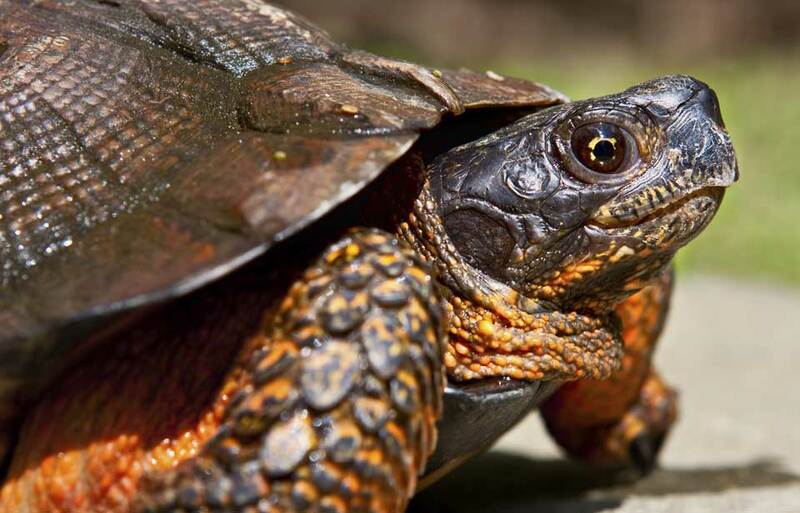 Because of this decline, the Committee on the Status of Endangered Wildlife in Canada (COSEWIC) has assessed the species as Threatened, but the species is not currently designated as At Risk under the Species at Risk Act (SARA). 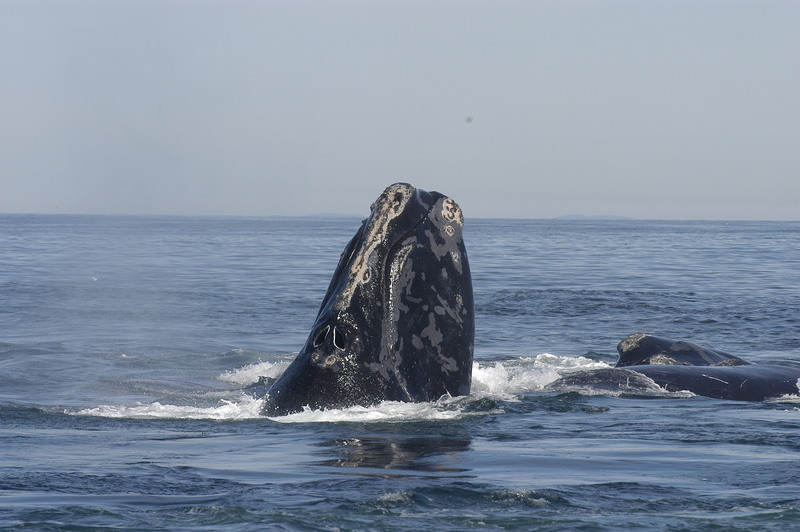 Several provinces have ranked the species as sensitive or at risk. As the Barn Swallow is a migratory species, the bird, its nest and eggs are protected by the Migratory Birds Convention Act. 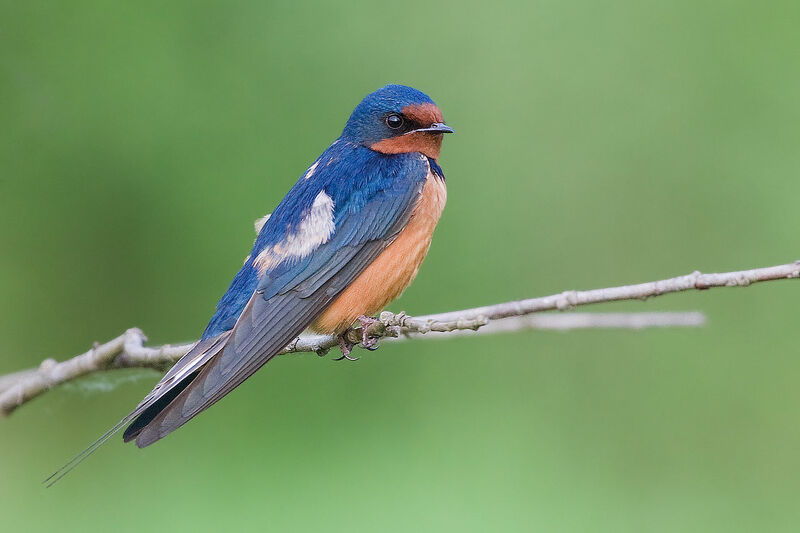 To prevent the Canadian Barn Swallow population from declining further, researchers need to find out more about the population’s decline and its causes. 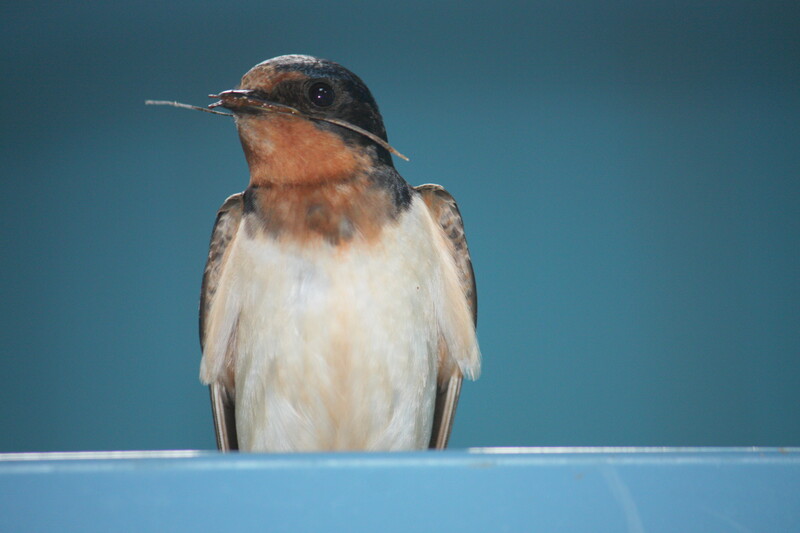 This is why a Dalhousie University project, partially funded by the Canadian Wildlife Federation, is testing hypotheses to pinpoint exactly why the swallows are disappearing. 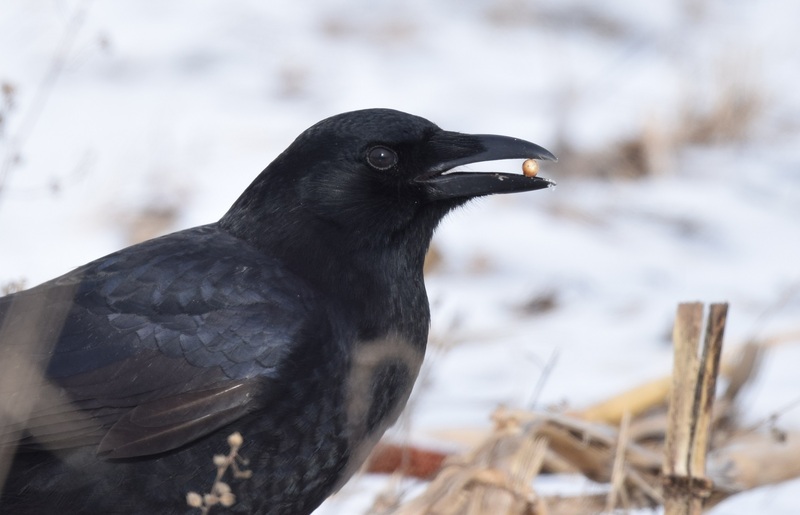 Scientists at Environment Canada are monitoring nesting birds and studying how they are affected by weather and landscape change. 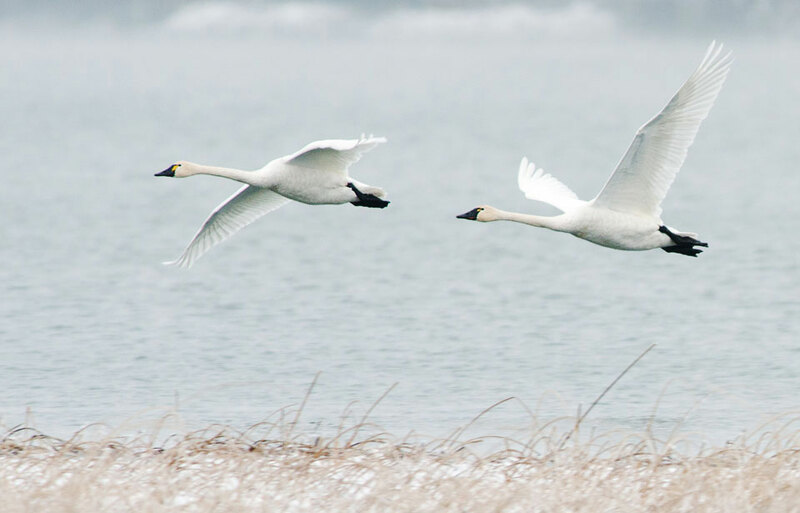 They also study the “chemical fingerprint” of the birds’ feathers (molecules in a bird’s feathers differ from one area to the next) and use geolocators to learn more about their migration routes and wintering areas. There are actually quite a few things you can do to help the Barn Swallow! 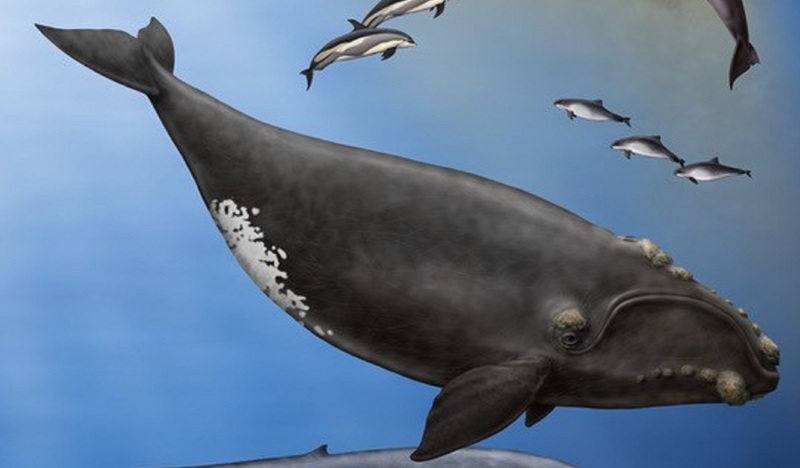 Because researchers can’t be everywhere at once, they need more pairs of eyes to gather valuable data on the species. 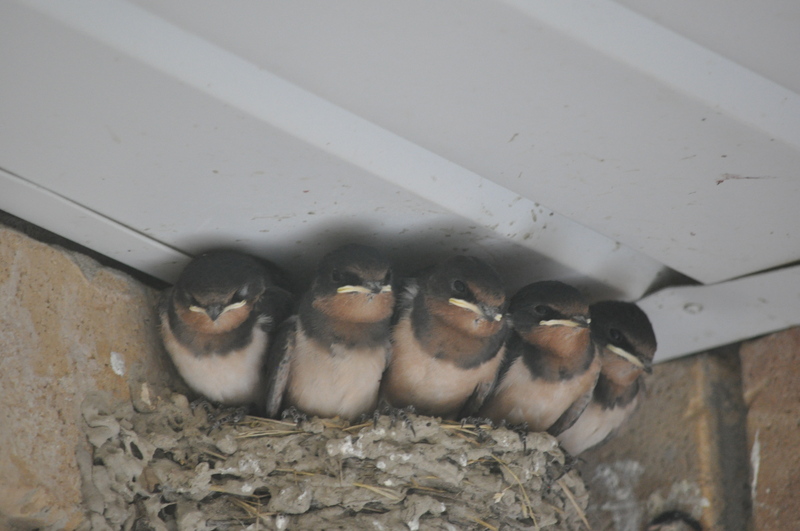 You can help by participating in the Bird Studies Canada Barns Swallow Nest Watch Program, where people monitor swallow nests every few days during the breeding season. If you find a Barn Swallow nest on your property, you cannot remove it because it’s protected under the Migratory Birds Convention Act. 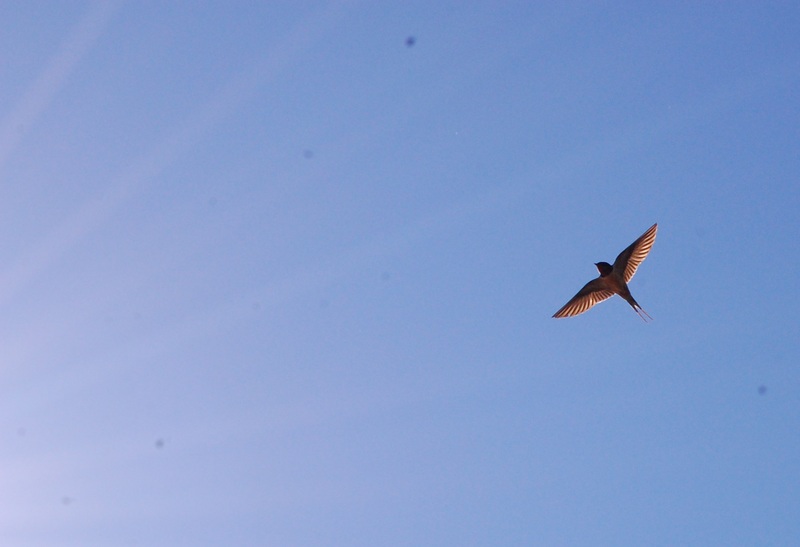 But there are several ways you can ensure that cohabiting with the swallows is as easy as possible! To prevent droppings from accumulating, placing newspapers or an old bed sheet under the nest, to be replaced when too dirty, can solve this issue. Please note that Barn Swallow droppings are not known to carry any infectious disease for humans and the period during the nesting period when droppings appear below the nest is quite short. 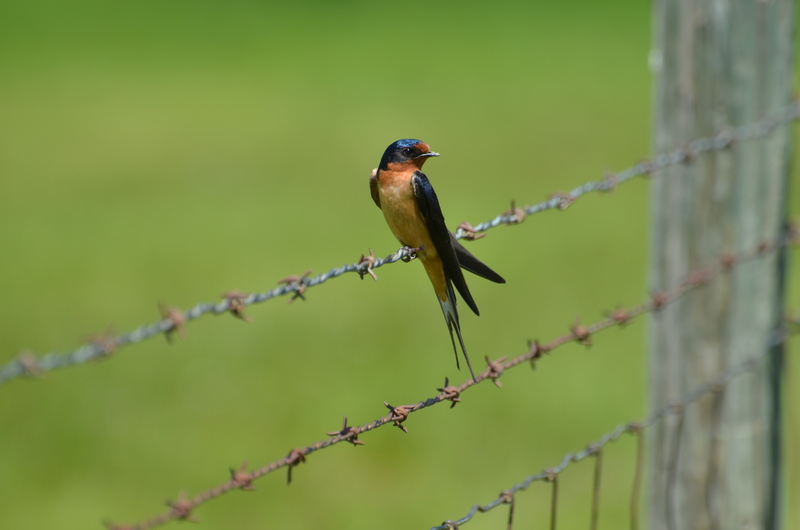 If you wish to see Barn Swallows around your property, you can create nesting habitat by placing nesting cups or shelves in protected areas close to the ceiling in buildings that will be accessible to the birds all summer. Be sure to provide a small mud source and leave barn doors open at all times. You can even build a roofed structure in order to replace habitat when an old building is demolished! Remember, Barn Swallows are useful to have around, as they eat those pesky flying insects that badger us during the summer. Not using pesticides around your property can help swallows, other insectivores and the environment! © Her Majesty the Queen in Right of Canada, represented by the Minister of the Environment, 2015. All rights reserved.